Car accident claims arise when a driver makes a mistake behind the wheel and causes a collision that injures another person. As with other types of negligence cases, the victim must prove that the other driver acted unreasonably under the circumstances. The victim must also prove that the other driver’s mistake caused the injuries. A successful claim allows the victim to recover compensation for hospital bills, physical pain, emotional distress, and more. Kenison Law Office is tenacious when it comes to auto accident claims. We will not stop pursuing a valid claim until our client obtains fair compensation. This approach garners attorney John B. Kenison, Jr. a great deal of respect as a car accidents lawyer in Manchester, NH, and it can produce a favorable result in your case. The steps you take following an accident are very important in establishing the cause of an injury. Get the name, number, and license plate number of any driver that stopped to offer assistance, as they may prove to be a valuable witness. Shortly after a car accident, the adjuster for the other driver’s insurance company will often contact the injured party to discuss the case. Ever wonder what adjusters actually do? Their job is to determine how much money the insurance company will agree to pay the injured party. In other words, insurance adjusters are professional negotiators. It can make sense to deal with the adjuster directly when an accident involves vehicle damage only. But when injuries are involved, there is too much at stake. Even minor injuries can require treatment and rehabilitation that lasts well into the future. Mr. Kenison worked for large insurance defense firms before devoting his practice to representing injury victims. He also serves as a mediation lawyer and arbitrator, helping parties reach settlement agreements in accident cases. Having sat at all sides of the negotiating table, Mr. Kenison knows what it takes to protect his client’s interests during settlement talks. Compensation in a car accident case is divided into two categories: special damages and general damages. Special damages are also known as economic damages. This terminology is a bit odd since all damages ultimately take the form of a money payment to the victim. To avoid confusion, think of special damages as compensation for the financial expenses the victim incurred as a result of the accident. General damages are also known as non-economic damages. They compensate for harm that is subjective in nature. To establish a “jumping off point” for negotiations, general damages are sometimes calculated as a multiple of the victim’s medical bills, but the final determination always reflects the individual circumstances of the case. Because there are no bills or receipts to establish general damages, they become a point of negotiation with the insurance company. Mr. Kenison works closely with his clients to document all of the intangible ways the car accident has impacted their life so the information is readily available at the time of settlement. 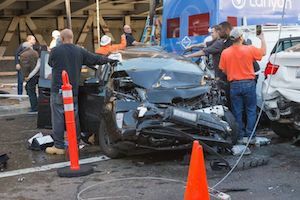 If you were injured in a collision and you believe the other driver was at fault due to distraction, speeding, intoxication, or other negligence, you need to act quickly to protect your right to compensation. First, seek medical treatment immediately if you have not done so already. This is crucial for your well-being, and for your ability to collect damages at a later date. Second, contact an attorney to schedule a consultation. Kenison Law Office meets with car accident victims without charge or obligation.